If you're looking for an insect repellent that really works - we have the answer! 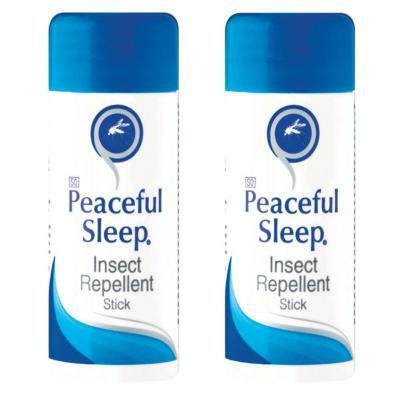 Peaceful Sleep is a South African repellent that's proven to prevent bites from insects, midges, flies, ticks, gnats and mosquitoes. Trusted by rangers on safari, it's the best repellent for keeping the bugs at bay. Peaceful Sleep in stick format is an easy-to-apply, clean, non-greasy stick repellent that's resistant to perspiration. Manufactured in South Africa to keep insects at bay when on safari, this light but effective repellent really works! Extremely effective and not unpleasant to use, it's an ideal solution to keep mosquitoes, midges and flies away. Each 30g stick contains 10.5g DEET as well as natural plant-based oils such as lemongrass and citronella, and the stick does not leave a sticky residue, which makes it perfect for sensitive skin. It works hard to prevent painful and irritating bites and can be applied to areas such as ears, wrists, ankles, neck and face for targeted protection. We try all our products before introducing them to our online offer and this is one of the BEST repellents we have ever used. Available as a pack of two sticks, and also in a Family Care, DEET-free range that's suitable for babies from 6 months and young children. I bought it for my husband. I hope he will prevent mosquitoes bite when we go on holiday. Had been looking EVERYWHERE outside Africa to get this!! Finally I was able to buy „the one and only“ good smelling 100% working insect repellent! !